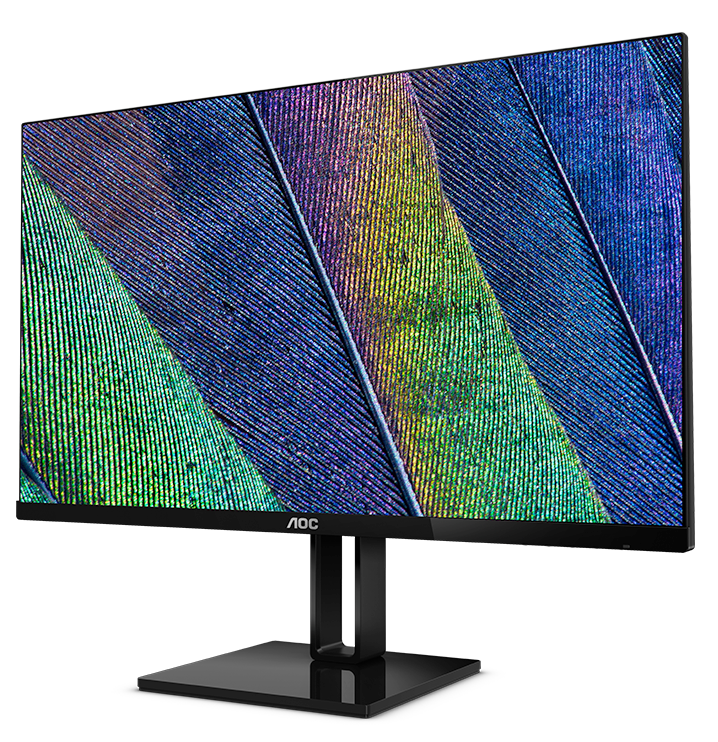 Display specialist AOC announces brand-new monitor series, V2, debuting with three monitors in 21.5”, 23.8” and 27” displays sizes. These elegant, super-slim monitors are equipped with 3-sides frameless IPS panels in Full HD (1920x1080 pixels) resolution, offering wide viewing angles (178/178) and accurate colours (72% NTSC gamut coverage). The new and innovative frameless “edge” design hides the display frame behind the panel for an ultra clear look. The sleek appearance continues with an extra slim side profile (7.7 mm for 21.5” and 23.6”, 7.9 mm for 27”), and finishes off with a pure, flat back cover without any bumps or bulges. An equally elegant and sturdy metal stand holds the monitor in its optimum position and provides over 20° of tilt adjustment, whilst housing power, headphones jack and video signal connections. These new V2 series monitors are also equipped with a quick 5 ms response time, 75 Hz refresh rate and AMD FreeSync. The new V2 Series introduces AOC’s innovative approach to monitor design combined with excellent visuals. The series debuts with monitors in three different sizes, the 21.5” 22V2Q, 23.8” 24V2Q and the 27” 27V2Q. All of these models are equipped with 3-sides frameless IPS panels, which deliver excellent viewing angle performance (178/178°) as well as good colour accuracy. 250 cd/m² brightness ensures good visibility in bright or sunlit rooms. The innovative design of the V2 series looks compact and elegant.These displays feel like a floating image in the air, unobstructed by thick bezels or a bulky back. The slim profile of the V2 series is as thin as a smartphone (7.7 mm for 21.5” and 23.8”, 7.9 mm for 27”). The V2 series boasts a 75 Hz refresh rate, AMD FreeSync support, and 5 ms response time, which together offer a smooth, tear-free and stutter-free gaming experience. Combined with their impressive looks and design, vivid colours and gaming capabilities, the V2 series is perfectly suited for students, home and entertainment users alike, who want to proudly showcase their monitors. Digital inputs including HDMI and DisplayPort enable connecting various entertainment sources besides desktop and portable PCs, such as game consoles, set-top boxes etc. Audio output enables connecting headphones or external speakers as well. Thanks to its appealing build, the V2 series is also suited for public spaces where the exterior design of a monitor becomes more important. The black, high-gloss finish of its square-shaped base, its hollow metal stand and bottom bezels hosting the OSD buttons all contribute to the premium feel of these displays. The V2 series also comes with innovative AOC technolgoies , such as Flicker-Free technology, which regulates brightness with Direct Current (DC) instead of PWM (Pulse Width Modulation), or the Low Blue Mode which reduces potentially harmful blue wavelengths. The innovation continues with “Clear Vision”, which increases clarity, sharpness and vividness of Standard Definition (SD) content. For more productivity, the V2 series supports easily manageable multi-monitor setups with the AOC Screen+ software. Supporting a much more sustainable and green planet, AOC’s V2 series adheres to the EPA 7.0 regulations as well. The 21.5” 22V2Q, 23.8” 24V2Q and the 27” 27V2Q include a DisplayPort and HDMI cable, are covered with a 3 years warranty and are going to be available in July 2018 with MSRPs of £119, £129 and £179, respectively.